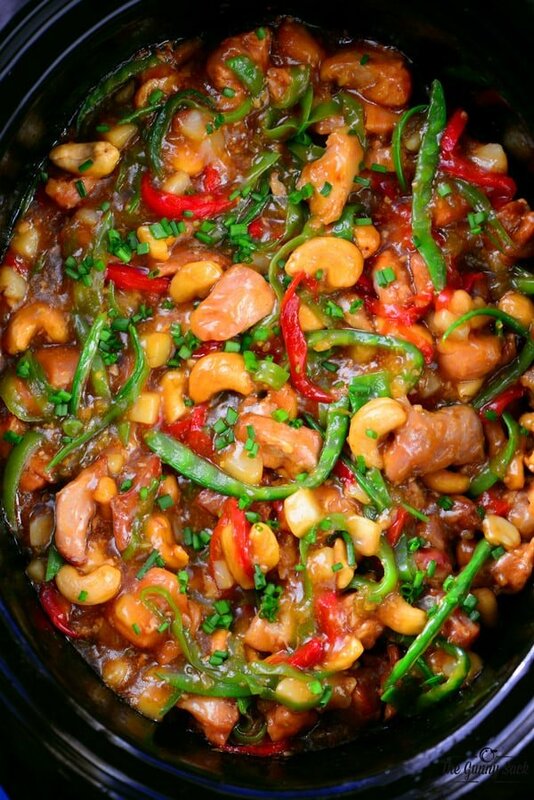 Slow Cooker Cashew Chicken is full of flavor and so easy to prepare! 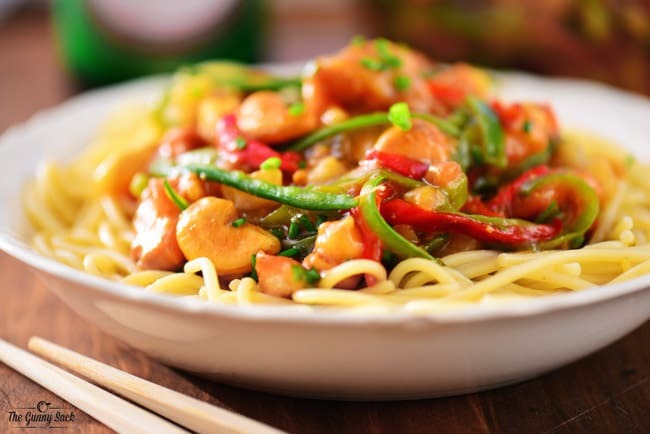 Skip the Chinese takeout and make this dinner recipe at home instead. Even though the weather outside is getting nicer, my slow cooker is still in use. In fact, I use my crockpot year round. The evenings are beautiful and I would rather spend my time with my family and friends, than in the kitchen cooking. 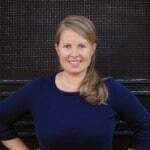 I’m always on the lookout for easy recipes, one pan dishes and easy meals that can be made on the grill. 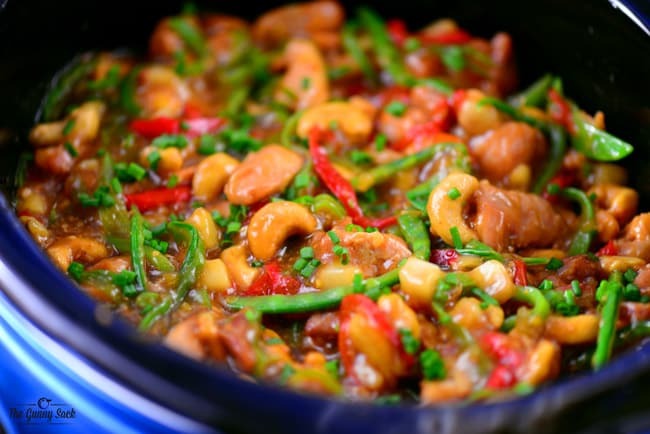 Today I am sharing a delicious recipe for slow cooker cashew chicken. It’s full of flavor and so easy to make! 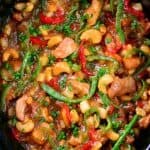 Disclaimer: Please note that some of the links in this post are affiliate links to the items I used to make this Cashew Chicken. There is no additional cost to you, but I may earn a small commission if you purchase through those links. Thank you for your support! 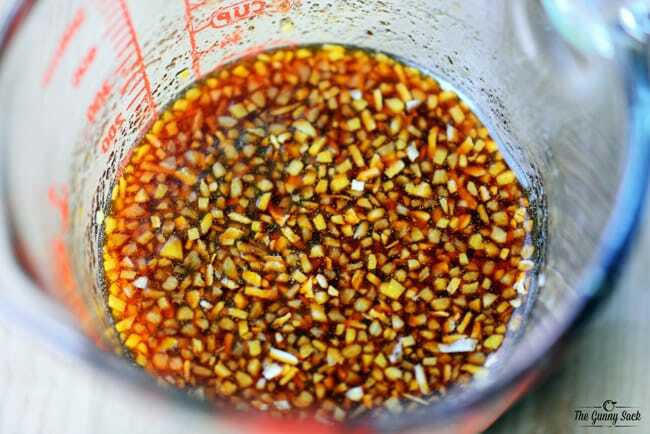 First, whisk together honey, brown sugar, soy sauce, minced onion, vinegar, sesame oil, olive oil, Sriracha sauce, hoisin sauce, minced garlic, and minced ginger in a small bowl and set aside. Cut the chicken into pieces. (You can use chicken thighs or chicken breast. I’ve tried this recipe both ways and it turned out great both times. If you have concerns about the chicken drying out, then it would be best to go with chicken thighs.) Put the chicken in a slow cooker (I used my 3.5 quart Crock Pot) and add sliced red peppers and chop celery. Pour the sauce over the ingredients in the slow cooker. Cook on low for 2-4 hours, depending on your slow cooker. Remove the sauce from the slow cooker and put it into a saucepan. Bring it to a boil over medium heat. In a small bowl stir together cold water and cornstarch. Slowly add the cornstarch mixture to the saucepan stirring constantly. Cook until thickened. For the sauce in the slow cooker and stir to coat the chicken. Sauté the snow peas in the water chestnuts briefly before adding it to the crockpot, if desired. I’ve made this recipe by sauteeing the veggies, adding them to the crockpot, stirring and then serving immediately. I’ve also made it by just putting them directly into the slow cooker, stirring, and then setting the slow cooker on warm for thirty to sixty minutes. 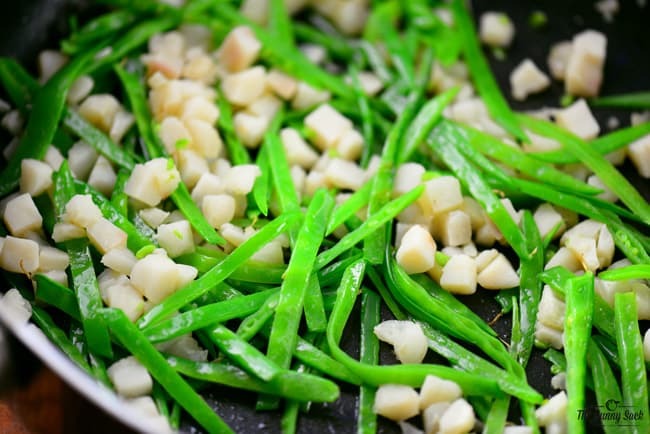 Sprinkle with sliced green onions (or chives) and cashews before serving. Cut the chicken into pieces. 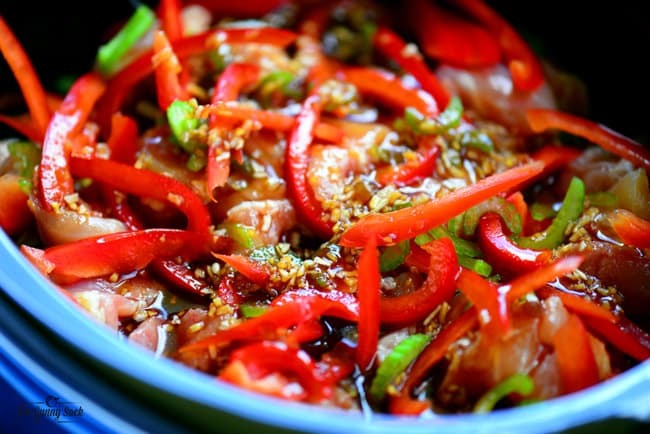 Put the chicken in a slow cooker, add sliced red peppers, and chopped celery. Pour the sauce (recipe below) over the ingredients in the slow cooker and stir to coat. Cook on low for 2-4 hours, depending on your slow cooker. Remove the sauce from the slow cooker and put it into a saucepan. Bring it to a boil over medium heat. In a small bowl, stir together cold water and cornstarch. Slowly add the cornstarch mixture to the saucepan stirring constantly. Cook until thickened. Pour the sauce in the slow cooker and stir to coat the chicken. Sauté the snow peas in the water chestnuts briefly before adding them to the crockpot, if desired. Sprinkle with cashews and sliced green onions (or chives) before serving. 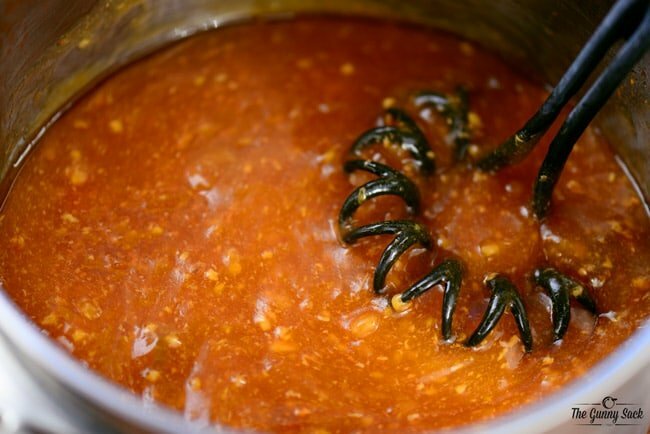 Whisk together honey, brown sugar, soy sauce, minced onion, vinegar, sesame oil, olive oil, Sriracha sauce, hoisin sauce, minced garlic, and minced ginger in a small bowl and set aside. I made this today and it was way too sweet with 1/2 c of both brown sugar and 1/2c honey. Will make it again starting with 1/4c brown sugar and adjust sweetness from there. 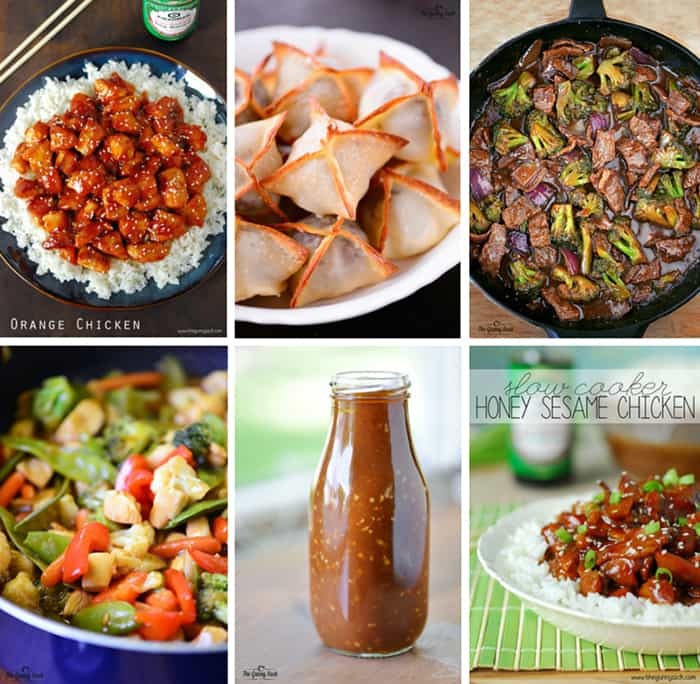 Do you think leaving out the sriracha would change the taste? Pinned.